This Dock Shelter features exclusive certified performance fabric, designed specifically to meet or exceed the most demanding dock seal and shelter requirements. Solid tubular steel construction with an “X” frame to absorb impacts from misaligned trucks, protecting the shelter and the building from damage. The top and side covers are made from a translucent, flexible plastic. 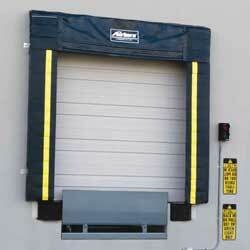 This allows for natural light to enter the loading dock during daylight operations. High visibility yellow guide stripes help guide vehicles into the correct loading position.